When you don't have the budget to afford multiple sets of bleachers, our transportable bleachers may be just the ticket, share them between soccer and baseball fields by easily moving them. IMPORTANT NOTE: Order one "Wheel Kit" (required) to move multiple sets of bleachers. A "Light Duty" Transport Wheel Kit (BRB-TKL) must be ordered with 5 row transportable bleachers. 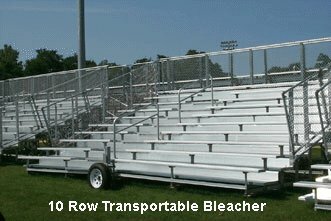 A "Heavy Duty" Transport Wheel Kit (BRB-TKHDS) must be ordered with 10 row transportable bleachers. Same as above except with galvanized steel frames instead of aluminum. 5 Row,24'L -Standard Transportable- Seats 80, 1472 lbs. 5 Row - 21'L, Preferred Transport- Seats 70, 1446 lbs. 5 Row 24'L Preferred Transportable,Seats 80,1559 lbs. 10 Row 15'L Preferred Transport Seats 100 2161 lbs. 10 Row 21'L Preferred Transport, Seats 140, 3068 lbs. 10 Row 24'L Preferred Transport, Seats 160, 3285 lbs. 10 Row 24'L Deluxe Transportable, Seats 133, 3422 lbs. 5 Row 15' L -Standard ,Seats 50 - 1085lbs. 5 Row 21'L -Standard ,Seats 70 - 1556 lbs. 5 Row 24'L -Standard , Seats 80 - 1658 lbs. 10 Row 15'L -Standard ,Seats 100 - 2496 lbs. 10 Row 21' L -Standard ,Seats 140 - 3641 lbs. 10 Row 24'L -Standard ,Seats 160 - 3847 lbs. 5 Row 15' L -Preferred ,Seats 50 - 1140lbs. 5 Row - 21'L -Preferred , Seats 70 - 1632 lbs. 10 Row- 24'L, Preferred ,Seats 160- 3934 lbs.